Posted by dolorosa12 in life, university, work. 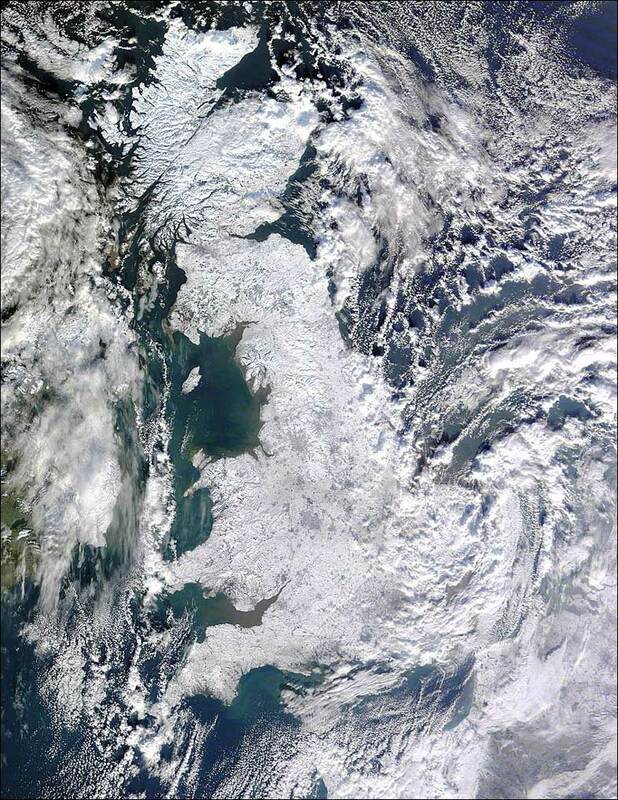 That is a satellite image of Britain as it is at the moment. I’ve just got back from a month in Australia, where I spent pretty much every morning swimming at the beach. As you can imagine, I was shocked at the contrast. My time in Australia was a mixture of nostalgia and happiness. It was very odd to return, and at times I felt like the typical exile that I write about, a person who lives in a foreign land, and then returns home to find that it’s not ‘home’ any more. But for the most part, my trip back was enjoyable, and it was wonderful to see all my friends and family again. I landed in Melbourne first, and spent about five days staying with my dad, stepmother and two little half-sisters. The time was marred only by the fact that Dad had giardia, and looked rather emaciated. But it was fantastic to see my youngest sisters, who are growing up so quickly that they seem like different people every time I visit them. I also managed to see several other friends while I was in Melbourne, which was excellent. After that I flew to Sydney, for what turned out to be a three-week-long catch-up fest. The first night I was there, I went to a housewarming for two of my usydgroup friends, and the day after that, pretty much everyone I knew in Sydney (and some Canberrans) turned up for a picnic that I organised at Bronte. I had my first swim of the holiday there, and it was great. I saw most of those people (a mixture of usydgroupians, Canberrans and others) a couple of other times during my trip, but it was great to see them all together, especially at an event that I’d organised, as I find organising and hosting events very stressful. I saw a lot of my extended family. I was living with my mum and my sister (who had just moved back home) of course, but I also saw a lot of my grandparents, four of my aunts (the fifth was on holiday in Japan, Korea and Thailand), most of my cousins and my uncles. I also managed to catch up with one of my Obernet friends for lunch and secondhand bookshopping in Newtown. Raphael and his mother drove up from Canberra for a few days, and it really meant a lot to me that they did this primarily to visit me. We had a great time browsing the bookshops in the CBD. Aside from all the socialising, I managed to spend some time earning money by working in my old patisserie where I worked as an undergrad. It was the Christmas lead-up, so it was insane, of course. I realised how much I enjoyed doing that work, which makes me worry that it may be the only job I ever completely enjoy doing. I suspect I’m destined to work in that patisserie on and off until the day I die. It was a good trip, but it raised lots of troubling emotions. Although I relished seeing everyone again, I couldn’t help but feel a little awkward, as though I was trying to force myself into a space that no longer existed. I suspect that this feeling might’ve lessened if I’d remained longer. It’s hard to explain, but if you go away for this long, people (of course) do things without you. Their lives change without you. I’m not saying these changes are for the worse, just that you realise that the universe goes on without you. Time doesn’t stop for you. Of course, as soon as I got back to Cambridge, I wanted to go back to Australia. The snow, which was such a novelty last year, is a pain this year. I can’t run outside or I’ll slip on the black ice. (I saw some hardy souls running in shorts today. Their knees were bright red with the cold.) The lack of sunlight depresses me. Most of all, I lapse back into childhood the second I spend any time with my mother. Although I’ve always been able to handle the more practical aspects of independence (cooking, cleaning, shopping, budgeting etc), I’ve always been incredibly emotionally dependent on my mother. It takes me about a month to regain my emotional resilience after seeing her. At the moment, however, I just want a hug. Posted by dolorosa12 in childhood, fangirl, memories, work. Sometimes I simply adore the kids at the school. Today, not only did I have the most amusingly trippy conversation ever with one of them, but a bunch of the others watched the Buffy film. I shall give further details about both occurences further, but first, let me relate a truly bizarre dream I had last night. The dream took the form of a home-video memory, and, at the time, seemed totally plausible as something of which I’d have a video record. I was six, and, with two-year-old Mimi, cycling around Lake Burley Griffin. Nothing unusual about this, except that I didn’t learn to cycle without training wheels until I was seven, and Mimi certainly couldn’t ride a bike at two. It was a hot summer Canberra day, and Commonwealth Park was full of people out enjoying the sunshine, dressed in a fetching array of early ’90s clothes: men in stubbies, kids in leggings and big, fluoro T. shirts and women with crazy, permed hairstyles. Some people were running through the sprinklers, a throw-back to a less water-conscious time. All of a sudden we met up with E., an old family friend who is my age and whom I’ve known since the first day I moved to Canberra (when I was three). She was dressed in her school uniform, riding a small bike through the water of the Lake, to school. This wouldn’t work for many reasons. Firstly, she was dressed in the Red Hill Primary uniform – but at six, she still attended Griffith Primary, which only closed down when we were eight. Secondly, she lived on the same side of the Lake to her school. Dream logic ftw, huh? Finally, Mimi and I arrived back at our old house in Forrest, which, inexplicably had a bush shower in the kitchen. Umm, no it didn’t. All the time, I was an observer of this dream, rather than a participant, as if I were watching it on TV. It was a very strange experience. Me: Be more careful when you run around with hula hoops, please. Kid: I am careful, but my master makes me bad. Kid (climbing up on to the equipment): Yeah, I have a master. He’s invisible and sits on my back and tells me to be evil. You can’t see him. Me: Can I speak to him? Kid: No. He only speaks to me. Me: So, what’s his name? If I speak to him, can you tell him what I say? Kid: His name is Aslan, but he’s not the Aslan from Narnia. Me: Hi Aslan. It would be very helpful if you could tell (kid) to be good, not evil. Kid (thinking): He says that if you want to speak to him you need to fight a big battle and face a challenge. And then, the reward would be DEATH. I gave up, bemused and amused. I am further amused at the older kids’ obsession with my own favourite TV series (and the seminal show of my teenage years), Buffy The Vampire Slayer. They’d been nagging for ages to bring in a DVD and watch it on a rainy day, but we always said that because the series is rated M, they’d not be allowed to watch it at school. But they somehow figured out that the 1992 movie was rated PG, and today they brought it in to watch. Unfortunately, I was not in charge of this activity, and so am still a Buffy movie virgin, alas. Since Joss (AKA God) himself has described the film as an imperfect rendering of his perfect Buffy vision, however, I suppose it’s not too much of a loss to me to have missed out yet again. It did, however, remind me of when the film came out. In Australia, it came out when I was nine, in 1994. I was not allowed to watch it (and, indeed, wasn’t all that interested), but several of my friends (whom I’ll assign random initials) were. My best friend at the time, S., and two boys in my year, E. and K., were utterly obsessed, and spent their days playing Buffy, carrying around smelly garlic and sticks stuck together to form crosses. S. also persuaded her mother to let her raid the herb cabinet, and packed our shared desk with packets of ostensibly vampire-repelling herbs. Good times.